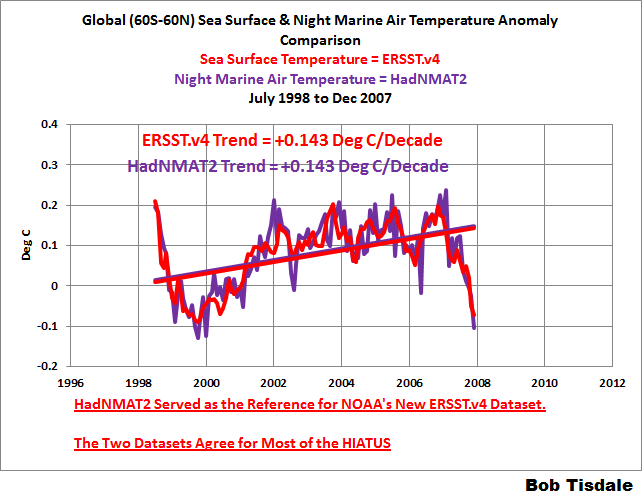 Open Letter to Tom Karl of NOAA/NCEI Regarding “Hiatus Busting” Data | Watts Up With That? UPDATE: See the note at the end of the post. Liu et al. 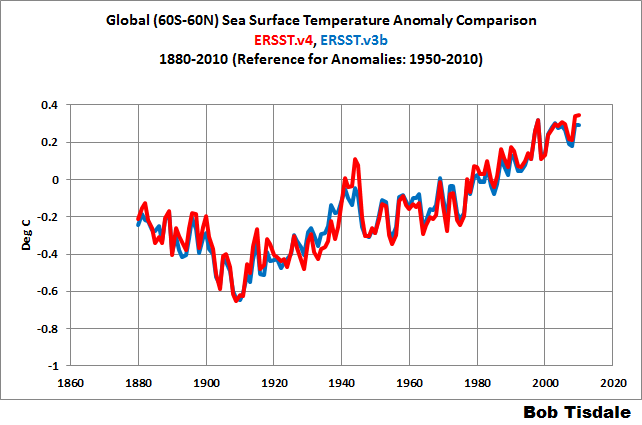 (2015) Extended Reconstructed Sea Surface Temperature version 4 (ERSST.v4): Part II. Parametric and Structural Uncertainty Estimations. 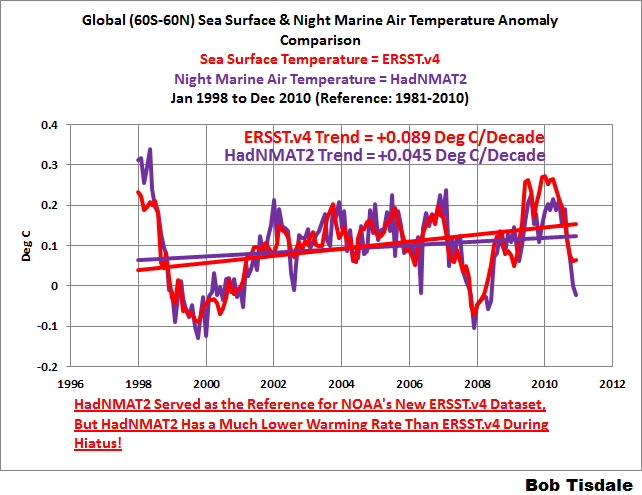 The intent of this letter to present when and how the new NOAA sea surface temperature data differ during the hiatus from the night marine air temperature data, upon which it is based, which are used for bias adjustments over the term of the data. Figure 1 is Figure 3 from this weekend’s post More Curiosities about NOAA’s New “Pause Busting” Sea Surface Temperature Dataset. The new NOAA ERSST.v4 sea surface temperature data for the latitudes of 60S-60N have a noticeably higher warming rate during the hiatus than the UKMO HadNMAT2 data, which served as the reference for bias adjustments in your new ERSST.v4 data. From January 1998 to December 2010, the last month of the HadNMAT2 data, the new NOAA ERSST.v4 data basically doubled the warming rate of the reference HadNMAT2 data. In other words, the HadNMAT2 data do not support your claims of no slowdown in global warming. Someone might want to try to claim that the higher warming rate of the NOAA ERSST.v4 data is caused by the growing number of buoy-based versus ship-based observations. That logic of course is flawed (1) because the HadNMAT2 data are not impacted by the buoy-ship bias, which is why NOAA used the HadNMAT2 data as a reference in the first place, and (2) because the two datasets have exactly the same warming rate for much of the period shown in Figure 1. That is, the trends of the two datasets are the same from July 1998 to December 2007, a period when buoys were being deployed and becoming the dominant in situ source of sea surface temperature data. See Figure 2. Note that magnitude of the trends during that time period. Back in 2008, few people were discussing a slowdown in global warming. In reality, the differences in the trends shown in Figure 1 are based on the responses to ENSO events. Notice in Figure 1 how the night marine air temperature (HadNMAT2) data have a greater response to the 1997/98 El Niño and as a result they drop more during the transition to the 1998-01 La Niña. We might expect that response from the HADNMAT2 data because they are not infilled, while the greater spatial coverage of the ERSST.v4 data would tend to suppress the data volatility in response to ENSO. We can see the additional volatility of the HadNMAT2 data throughout Figure 2. At the other end of the graph in Figure 1, note how the new NOAA ERSST.v4 sea surface temperature data have the greater response to the 2009/10 El Niño…or, even more likely, they have been adjusted upward unnecessarily. The addition additional response of the sea surface temperature data to the 2009/10 El Niño is odd, to say the least. The monthly fitting coefficients (gray lines) are shown in Fig. 5, which overall fits the fifth assumption that the biases vary slowly with time. To filter out potentially spurious high-frequency noise in the fitting coefficients, a linearly fitted coefficient was used in ERSST.v3b (Smith and Reynolds 2002). Subsequent to ERSST.v3b several analyses have highlighted the likely presence of substantive multidecadal bias variability throughout the record (e.g., Kennedy et al. 2011) rather than simply around the transition from mainly buckets to mainly ERI measures around the early 1940s. In ERSST.v4, a Lowess filter (Cleveland 1981) has been applied on Ay (Fig. 5) and allowed to vary the bias adjustments throughout the record. A filter coefficient of 0.1 is applied to the Lowess, which is equivalent to a low-pass filter of 16 years and represents the low-frequency nature of the required bias adjustment. The reason to apply a filter is to make the bias adjustment smoother so that it may be more consistent with the assumption of applying a climatological SST2NMAT pattern of Am,y. However, we stress that higher-frequency changes in SST biases are virtually certain to exist as indicated in Thompson et al. (2008), Kennedy et al. (2011), and Hirahara et al. (2014). Shorter windows or use of annually averaged data would be noisier by construction because the estimate at any given point would be based upon a smaller sample and it is not clear at what point there becomes a risk of fitting to random sampling noise rather than systematic bias signal. The preference is for robust estimation of the multidecadal component of the bias adjustments using a coefficient of 0.1 but may come at a cost of accurately portraying biases at times of rapid transition (e.g., the WWII era). And as illustrated and discussed above, could the filtering you’ve elected to use also “come at the cost of accurately portraying biases at times of rapid transition” in response to strong annual perturbations from El Niño events during the hiatus? Something appears it may have definitely added unnecessarily to the buoy-ship bias adjustments of your new sea surface temperature dataset after 2007. This new paper is especially interesting in context of the Karl et al paper, that ‘disappears’ the hiatus. I suspect that the main take home message for the public (those paying attention, anyways) is that the data is really really uncertain and there is plenty of opportunity for scientists to ‘cherry pick’ methods to get desired results. I would tend to agree. The results of the statistical methods used on the earlier version of the NOAA sea surface temperature data (ERSST.v3b) did not provide the results NOAA was looking for now, so NOAA/NCEI, under your direction, mixed and matched methods until they found the results you wanted (ERSST.v4). June 11, 2015 in Karl et al. 2015. Thanks, Bob. I corrected it. I suspect the reply will be along the lines of ‘La La La, I’m not listening!’. There will be no reply. Why would anyone feel motivated to reply to an “open letter”, on what they surely regard as a hostile website, from someone who has not contacted them privately? A simple article rebutting the science would seem more appropriate. 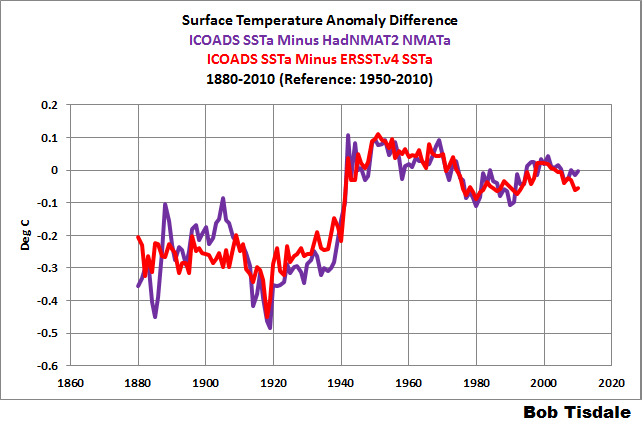 NMAT2 is itself is adjusted and “corrected” based on several variables including ICOADS SST. This makes adjusting SST on the basis of NMAT circular. What is rather odd is that NMAT2 has a pause; SST has a pause yet they combine the two to get a continued rise. IMO the magic happens due to weighting factor of 6.8 that is applied by Karl et al in favour of float data, that has been warmed up by 0.12 degrees. If they wish to suggest that NMAT is more reliable then they should conclude that the early 20th . warming ( natural ) is indistinguishable from the late 20th c. rise ( natural + AGW ). The logical implication is the AGW in undetectable. a Lowess filter (Cleveland 1981) has been applied on Ay (Fig. 5) and allowed to vary the bias adjustments throughout the record. A filter coefficient of 0.1 is applied to the Lowess, which is equivalent to a low-pass filter of 16 years and represents the low-frequency nature of the required bias adjustment. The Lowess filter has variable frequency response near the ends of the data. The usual kernel based filters require a full window and in this case would stop at least 8 before the end of the data ( even more for a well behaved filter ). Lowess starts to apply different processing at the ends to enable it to give a result, however there is no magic solution. You *cannot* effect a 16 year filter using 8 years of data. Period. Lowess may be a kind of 16y filter over most of the range but it is not that at then end. What usually happens with Lowess is that it runs off in one direction or the other, similar to padding a running mean by repeating the last data point. Since the data is rising it will tend to run high at the end. This may well mean that thier “bias” calculations run in the last decade of the data. This would appear to be borne out by Bob’s figure 1 above. Mike, you can see the differences in the late “run-off” in Figure 5 from Huang et al based on the different Lowess filters. Thanks, Mike. Yes, “circular”, as in positive feedback. Thanks Bob. In this case lowess (0.1) seems to work OK at end . The 32y version is suspiciously flat. At the beginning of the series both the 32y and 16y lowess are obviously badly distorting the data. Of course, knowing whether a filter is going to work “about right” or distort the data makes it useless. IMO lowess should apply consistent processing to all data and stop when it can’t, ie at the ends, just like any other fitler. One of the reasons climatologists seem to like lowess is because it runs up to the end of the data but this is just as bad a padding a running mean etc. Amateur time. re. SST yes they do say that. Which still means SST is an input to NMAT even if it is not month by month. Now consider the air-sea difference. There is massive swing of about 0.5 K around Sept 1939 . So using the “climatological” average will be badly out on both sides of that date. This was the original motivation for all the “bias correction” going on in HadSST2 and later. This reflected in the graph you reproduce from Huang. We can also note that NMAT get replaced by SST for Suez area at the end of 19th c.
Now if the air-sea difference is wrong, then all the guessing games and models about changes in the boundary layer will be wrong and compensation for deck height will be wrong. This is quite complex processing. I can see why Hadley had not made this data public yet. They had released a paper for discussion of their methods but were not confident enough to publish the dataset. It would have been wiser not to let Tom Karl play with it either. Once that was out, they were under precssure to release NMAT2, even though they clearly were not ready to do so. As usual, anything that does not fit preconceived expectations is deemed to be a “bias” and is studiously rubbed out. This means that any real climate effects get “corrected” away and all that is left is what they expect to be there : AGW plus some wiggles to make it look “climatey”. My paper was peer reviewed by a couple of my best friends and therefore there is nothing wrong with my data or methods. But who WAS it reviewed by? Who are the “two” star-panel all-knowing judges of all things dumped in wet buckets in wet oceans the past 100 years? Ah but Government “climate scientists” are fitted with teflon-coated kevlar vests. It is often said, “Never engage in a battle of wits with an unarmed opponent.” This is not, despite surface appearance, because it would be unfair to your opponent. Rather, it is because such a duel is unfair to you. For one who lacks the means to engage in a battle of wits, lacks also the means to recognize when he has lost, making him an indefatigable, if inept, opponent. No, no — not the “battle of wits” original. I want to know who pointed out that the “unarmed” one can’t lose. In a similar vein: Never wrestle with a pig, you both get dirty and the pig enjoys it. It is hugely damaging to the image of CAGW advocates that sceptics are now openly questioning whether their has been tampering with the raw data to exaggerate evidence for global warming. People have an instinct about dishonesty and often have zero tolerance for people in power lying, it is like a switch, switch it and your reputation and everything you say is turned to dust. I believe it has been openly pointed out that [there] has been tampering. Any graph that shows the 30’s as cooler then today is a lie. The trouble with pointing out the factual errors has means to review such ‘research’ is that it makes the assumption that such errors matter. In reality they do not , the authors know that within the area of climate ‘science’ facts have a very low value , the real value of work comes not from the reality of your data, but from the ability of your claims to show ‘faith in the cause ‘ and to provide useful PR through green friendly press headlines . In both cases Karl’s work has real value and follows in the path of fact light , or even lied filled , ‘research’ such papers from Mann, Cook, Lew , which have become part of the CAGW dogma which requires the faithful to so often defend the indefensible. By all means point out the problems, but do not expect to have any affect. I imagine a reply, if any, will be filled with even more distortions, all in the same direction. The problem is He can just ignore this letter and probably will, or respond with the equivelence of “We are the Scientists and we know what we are doing”. In other words mind your own business. What is really required and will never, ever happen is for all those Newspapers, Journals and Magazines that ran the original “headline” story also printed the letter for balance. As I said sadly it will never happen, it might get printed by Booker, Rose or Delingpole, but that would be all. About six months ago Booker began running serious stories about data tampering, it was a big moment because this had been a taboo subject. Booker’s stories are usually ignored, but the important ones then resurface as scoops two years down the line, it is a process. These allegations are already leaking into the landscape of the collective consciousness of the media, it will appear as if nothing is happen or getting through, that is a wrong impression. Bob, it doesn’t help to start such a missive with a totally wrong assertion. 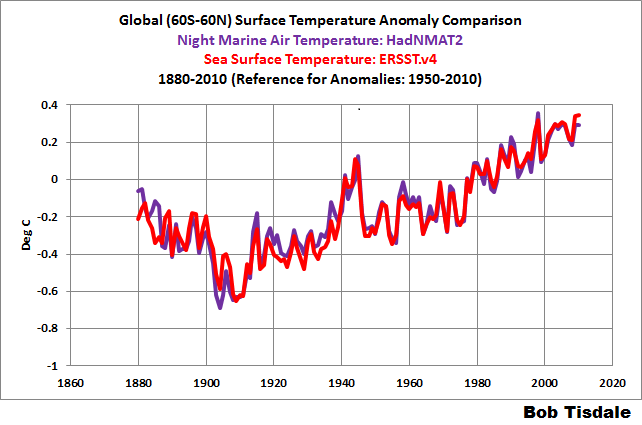 NOAA SST data is not based on NMAT. That is why it is called SST, and why there is such fuss about buckets, engine intakes, buoys etc. Nor is it a reference. It may be a point of comparison. A problem with NMAT is the sparsity of data. It’s a puzzle, because I presume you know all this. So Fig 1 will fall flat. Nick, you know very well that I understand that NMAT and SST datasets are based on different source data. Why do you even mention it? You obviously have not read Huang et al. 2015. As you’ll note in Table 1, HadNMAT is used as a reference for bias adjustments over the term of the data. You may not like my phrasing “upon which it is based”, but the new ERSST.v4 data, for the most part, mimic the HadNMAT2 data over the overlapping terms of the two datasets (1880 to 2010), where with the earlier version of NOAA’s sea surface temperature data (ERSST.v3b) there is [less] agreement, especially during the 1940s through 1970s. Nick, correction: the clause “where with the earlier version of NOAA’s sea surface temperature data (ERSST.v3b) there is no such agreement” should read, “where with the earlier version of NOAA’s sea surface temperature data (ERSST.v3b) there less agreement”. Nick, I have amended the text you didn’t like to “which are used for bias adjustments over the term of the data”. Bob, I mentioned it because the statement was clearly wrong, and probably unintended. Your revised statement is better. Huang et al do use NMAT for bias estimation, but that does not mean that they expect SST to track NMAT, else why not just use NMAT? They in fact show in Fig 5 how they observe the difference to evolve over time. They use NMAT as a reference to detect systematic differences between different SST methods, at a point in time. They don’t expect SST-NMAT to stay constant. That’s why your Fig 1 misses the mark. The arithmetic is set out in their Eqs 5 and 6. 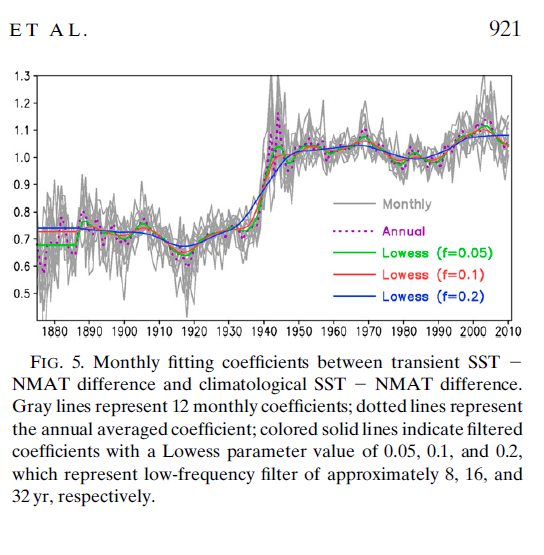 C is the climatological difference SST-NMAT, expected to be stable over time, (but seasonal). But the coefficients A certainly aren’t, as Fig 5 shows. Nick, are we having troubles with semantics again? Let’s run through a sequence here. ICOADS is the source for sea surface temperature data. 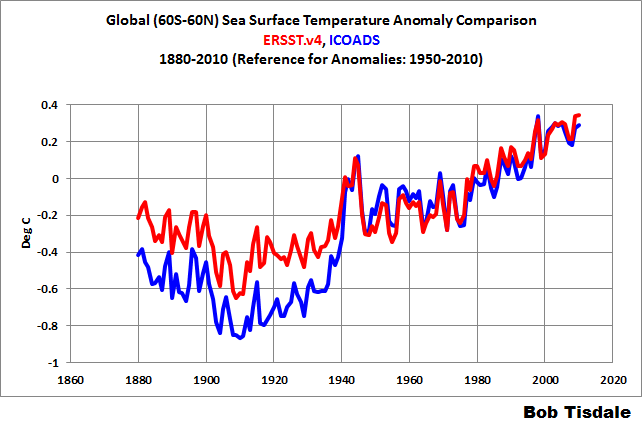 Here’s the ICOADS data compared to the new NOAA ERSST.v4 data for the latitudes of 60S-60N. So that’s the start product versus the new NOAA end product. NOAA wasn’t obviously satisfied with their earlier ERSST.v3b data, so they updated it to ERSST.v4. The two are compared next. NOAA used an earlier version of a marine air temperature dataset for bias adjustments of the ERSST.v3b data, but they ended those bias adjustments in the early 1940s. On the other hand, NOAA used the UKMO HadNMAT2 data for bias adjustments over the full term of the data, which is why the ERSST.v4 data mimic the HadNMAT2 data. NOAA certainly did not use the HADSST3 data for the bias adjustments on the ERSST.v4 data. With respect to Huang et al. Figure 5, it presents the temperature difference between the ICOADS sea surface temperatures (absolute) and the HadNMAT2 night marine air temperatures (absolute), with the different Lowess filters applied to the difference. For the next graph I’ve converted them to anomalies before subtracting the HadNMAT2 data from the ICOADS SSTa data. Also shown is the difference between the ERSST.v4 data and the ICOADS SSTa data. There are of course differences between the two curves due to infilling, data filtering and additional tweaking, but it’s blatantly obvious to create the ERSST.v4 data, NOAA subtracted the HadNMAT2 data from the ICOADS SSTa data…aka bias adjustment so that the ERSST.v4 data mimicked the HadNMAT2 data. The replication in writing of what is in the mind is actually quite difficult. We think far less in words than most psychologists believe. One of the reasons that psychology is in such a bad state is that psychologists are trained to be “word thinkers”.– but that is off topic. This was a very good open letter Bob. Thanks for taking the time to do it. For years now I have seen government agencies and those that they regulate pervert data and distort various trials or experiments. These perversions have gotten ever worse with time. We must call out the perpetrators every chance we get so the public can start getting the idea that climate “science” and medical “science” no longer follows the scientific method and the so-called results they get are near worthless. I have no idea what it would take to get the scientific community to return to the scientific method and honesty, but I do know we need to do that to prevent wholesale disaster in many areas. Trofim Lysenko and his pseudoscientific movement termed Lysenkoism is one example of what happens when politics poisons science, but there are many, many more. What is pervert data, and does it have anything to do with the big discussion regarding the term lesbian, that we had yesterday? No, I missed the lesbian discussion. “pervert data” should read “perverted data” …. although, I do think “pervert data” is not far off the mark. Actually the original just needs commas “government agencies, and those that they regulate, pervert data…” to read well. 1) “If this is an issue you should publish in the peer reviewed journal.” Which would then let Karl et al do the peer review. And thus the paper would never see the light of day (at least until after Paris). 2) “This is just a conspiracy theory.” Even though Karl et al claims that everybody else has been faking the Pause for the last 15 years which seems to imply Karl et al think the exact reverse. Logic cannot be a strong suit of anyone who wrote this paper. 3) Just ignore it. Their reputation is damaged already. 4) retraction of the paper. The paper has served its purpose; it has been widely quoted in the Press, the BBC and other news outlets. The ‘pause’ never existed, that’s the message people hear. Just like the 97% consensus. The facts don’t matter. I agree, it’s like apologies printed in the UK Press after a front page story which lasted several days; usually a short paragraph buried somewhere on page 17 with other space fillers. The message; Keep it simple and keep repeating it. It will help them in Paris but in the long run this sort of thing stinks and the press are beginning to catch on. It will be a pyrrhic victory for the advocates of CAGW, and it will haunt them when their backs are against the wall. Wake up and smell the coffee, man! The liberal-dominated press are in on this sc@m! Why is public funded research “paywalled” ? Nonetheless, your point is an extremely important one about public funding of science in general. Often, if you write to the author and ask for a copy, they will send you one for research purposes. But not if your only reason is to show they’re wrong! Surely there is a fundamental flaw of logic in this – and many other papers? The data is the data. Unless we have “better” data – in which case that is surely “the data” – how can we adjust the best data we have? It is the same with all these temperature adjustments. Homogenisation is fine, as is using the data to infill areas with missing data, but on what possible basis can reasonably accurate data be changed using less than reasonably accurate proper data? If you simply substitute less accurate and less reliable data for more accurate and more reliable data, your conclusions MUST be less accurate and less reliable. I often suggest that the error bands should be increased whenever making adjustments/homegenisation. One may have the intent that the ‘adjustments’ are corrections in the right direction, but it may be that far from ‘improving’ the data, they are perverse and render it less accurate. The truth is that none of these data sets is fit for purpose, and those that use them go on to over extrapolate them. The problem is, that when it comes to both land and sea based temperature measurements, even the best just ain’t very good. Data, once “adjusted”, cease to be data; rather, they become merely estimates of what the data might have been, had they been collected timely from properly selected, sited, calibrated, installed and maintained instruments. “Infilling” merely spreads these estimates to adjacent areas in which no instrument has been sited, or in which the sited instrument in non-functional. If data are important, then data collection and accuracy are important. This is particularly true in fields such as climate science, in which it is impossible to rerun experiments plagued by bad or missing data. The cavalier attitude of climate science toward data accuracy and comprehensiveness is appalling. Is it OK if I quote you when explaining what is wrong with current climate science? Very well said. Every adjustment to the data weakens the data. The Karl paper was widely reported within 12 (not 24!) hours of it’s release. Here at WUWT, we were witness to the pre-publication announcement, leaking to the press, and the announcement of the paper by press release. Let’s stop for a minute. How many of us have had a paper appearing in the peer reviewed literature announced with a press release? I am sure many of us, getting published for the first time, thought the event was worthy of a press release, but alas, it was not to be. (Bitter Disappointment) As one professor put it, “next time, act like you have done it before”. Simple. We need to do Public Relations. We need to Know people who Know PR. We need to cultivate people in the media. Without PR, our message is simply not heard. In fact, The Karl paper was a good demonstration of how to get a message out. Instead of decrying the methods, people should have been taking notes. Sure, the warmists, with government aid have a big advantage, but that is no reason to give up, it is the reason to redouble efforts in that direction. Heartland Institute at least makes a splash (Go Team GO), once a year. But it needs to be a constant effort. Wish I was there this year. The largest single impact on recent SST warming trends in Karl, et al., resulted from the decision to extend ship data corrections beyond 1941 into the present. They used the NMAT data to compare with the post-1941 ship data and decided NMAT data justified the ship data adjustment. This correction cools the ship data a bit more in 1998-2000 than it does in the later years, which thereby adds to the warming trend. To evaluate the robustness of this correction, trends of the corrected and uncorrected ship data were compared to co-located buoy data without the offset added. As the buoy data did not include the offset the buoy data are independent of the ship data. The trend of uncorrected ship minus buoy data was -0.066°C dec-1 over the period 2000-2014, while the trend in corrected ship minus buoy data was -0.002°C dec-1. This close agreement in the trend of the corrected ship data indicates that these time dependent ship adjustments did indeed correct an artifact in ship data impacting the trend over this hiatus period. If extending pre-1941 ship data adjustments by itself produced nearly perfect agreement (-0.002 C/decade) with the uncorrected buoy data — why did they add an additional 0.12 C to the buoy data afterwards? Note: This is separate from the issue of how they weighted the buoy data to reflect the growing number/influence of buoys in recent years. I’m just trying to get a grip on when in the process, and why, they adjusted both the buoy data AND the ship data if a single adjustment placed them in agreement. I have a problem with a number like that without a confidence number being provided. I am getting tired of these amazing strings of significant digits. It used to be that observable data was used to prove or verify a theory. NOAA latest proposed “RUBBER BAND” datasets now do the opposite . The unproven and flawed theory is used to modify the very latest the observable data gathered with the latest equipment . No data is sacred any more as NOAA blindly modify any observable data to suit flawed theory which satisfies political goals of their bosses . if the scientific community turn a blind eye to this , then science as we used to know , is doomed . Assuming that is correct, Karl’s response will no doubt be a smug “cricket chirp”. Bob – just looking at Figure 1 and Figure 2, how would the results change if you ignored the data prior to 2002? Just eye-balling it, it would appear that the trend goes away, or even changes to down. I commend realists in their efforts to challenge papers such as Karl et al. (2015). They must surely know that over the next few months, the world is going to be inundated with numerous other “Karl et al” type papers in order to boost the propaganda behind the flawed global warming doctrine leading up to this December’s Paris Climate Conference. The reality is that what these alarmists are now producing is “crappy science” designed to fit a political narrative. You see, these people, who are determined to make Paris December 2015 a success by achieving an international agreement on fossil fuel energy use, have long abandoned credible science. Karl et al. (2015) is proof of that. In fact, the climate science is now totally irrelevant because realists have already blown apart the flawed global warming doctrine and its crystal ball models. The proof that the science is irrelevant is evident by what comes out of Obama’s mouth. Obama seems to have assumed the role of a self-appointed “Grand Mufti of the Mosque of Dangerous Man-Made Global Warming” … determined to save the world from climate catastrophes. And he’s going all out for it because he knows nobody can stop him! What ever happened to the vaunted “Separation of Church and State” purportedly revered by the progressives? Actually they been doing this ,and getting away with it, for years , you could even ask that if you where to take away these types of papers what would be left of climate ‘science’ research? Has anyone requested / demanded a retraction of the paper? What is the process for refraction? Greg, it’s the change in direction of propagation of a wave due to a change in its transmission medium. The phenomenon is explained by the conservation of energy and conservation of momentum. Due to change of medium, the phase velocity of the wave is changed but its frequency remains constant. That’s refraction. No she didn’t. Re-read the quotation you provided. She said there was plenty of scope for cherry-picking, she did NOT accuse Karl et al having done so. If you wish to say that, make your case, but do not misrepresent what Judith Curry or others have said to suit your own arguments. That is quite improper and should be ammended. Sans picking cherries where they lie? He meant to say that the data was highly cherry-pickable. EUREKA! You’ve identified a true catastrophe! As always, I truly do love a good graph of an experimental result — two experimental/observational results — without any sort of error bar, or error envelope, or error analysis. For one thing, we cannot tell whether or not the difference between the two SSTs is significant or insignificant. For another, we cannot tell whether or not we should be inclined to believe the error estimate, since it could hardly be less than the correction from the previous version to the new version (and I’m sure that the previous version had a similar error estimate given a similar base of data). The point being, of course, that one cannot really estimate the probability that a bias correction to better match an uncertain result is itself correct. I think that this is basically what you (and Judith Curry) are saying — that if you ignore any discussion of expected error, one can always find a way to tweak the data within it so that it shows warming, or cooling, or flat behavior and stays within its bounds, but all that means is that the change is not significant (in addition to being cherry-picking, the direct implementation of confirmation bias, etc — many statistical sins). The problem with statistical sins is that over time, they will return to bite you. If NOAA’s SST proceeds to consistently diverge from ARGO-based SST, especially as the number of ARGO buoys continues to smoothly increase, it will become apparent to everybody that the former is incorrect and that the “adjustment” used was ill-considered. The timing of the release of the result — right before G7, leading into the meeting later this year — will also be highly suspect. Karl had better hope that nobody decides to throw him under the bus, as he is now directly challenging Hadley and the ARGO project both and it wouldn’t be completely surprising if congress decided to get into the act and ask him some pointed questions about the transparent political timing vs the need for objective science. In the meantime, we can chalk this up to the latest in a long, long string of “corrections” that somehow always warm the present compared to the past compared to the previous un- oops I mean “less” — corrected analysis of exactly the same data! I’m dazzled. it is truly amazing that supposedly scientific error corrections come without any error bars. for all we or anyone else knows the error corrections have increased the error. In any case, a warming rate of less than 1.5 degrees per century, most of this confined to night time temperatures in cold regions of the earth, with very little daytime warming or tropical warming, is hardly the stuff of catastrophes. So what if the nighttime temperatures get a little bit warmer in colder regions of the earth? This will tend to reduce frost kill of vegetation and people, making it easier to grow food and easier for the poor to heat their houses. Cooling is simple and cheap. All it takes is water and evaporation and a warmer world is a wetter world. Heating on the other hand is expensive, because it requires energy. As a result it is cooling that is to be feared. The calculated 0.12 buoy adjustment is explained in section 5c. Huang computes 0.12 applying Kennedy’s method to Huang’s raw data. He gives no uncertainty interval. AND he does NOT note that Kennedy’s own estimate was to cool ERI, not warm buoys, with 0.12 plus or minus 1.7C! A factor of 10 greater uncertainty than the adjustment itself. GIGO. Thus was this reguritated dogs breakfast created. Thanks rgb, I have wondered about your point at the bottom of your comment : We’re adjusting the dataset now, we’re in a better position to do so “, however we’re not going to remind you that the dataset has already been adjusted N times. Further, we’re not in a position or don’t have the time to fully explain how we have or have not taken OUT all previous adjustments OR in our process correctly brought forward all the margins of error since we MAY not have simply gone back to the ORIGINAL dataset – IF it were available and we are inclined to share it now. I’m beyond dazzled …. dazed …. and further confused – guess that’s what the AGW camp always wants. Well, not exactly. If you read the paper/abstract posted, all they say is that the error bars are too big to conclude that it is hiding in the deep ocean. It might be. It might not be. But GRACE and ARGO combined cannot resolve it, at least over the reference period they studied, and they tried hard. Which should surprise no one. But it does continue to leave climate scientists with a bit of a puzzle. Do they continue to believe CERES and other products that claim a sustained TOA energy imbalance? If so, just where is the missing heat? That’s a serious problem for everything but hiding in the deep ocean, because the other “solutions” to the hiatus “problem” tend to assert that there isn’t really an imbalance, but things like aerosols are preventing the TOA imbalance and hence the warming. This is yet again a problem of resolution. Can we trust CERES to 0.5 W/m^2? Is it plausible that we can measure TOA imbalance globally from satellites at this resolution? There are multiple inconsistent claims for error out there in climate science and everybody seems inclined to (IMO) overestimate the precision of their own pet result, and as a consequence climate science in general claims lots of very precise but inconsistent things (or just leaves a discussion of error out of any sort of public debate where it would weaken “the cause”). I’m cynical about all of the data. Too many people, too much vested interest, too many completely implausible assertions of certainty, too little careful statistical analysis, almost no validation at all. they use everything to peddle up the warming. in GISStemp they use “missing data” to create warming bias. yesterday i took a look at the raw data at gisstemp for Uccle belgium and De bilt, netherlands and to my biggest amazement i found there 2 months with “data missing”. one for december 2014 in belgium and one for april 2012 in the netherlands. it should be interesting to compare these values of GISStemp with the original ones from the stations around the world. i bet there’s also a lot of warming bias due to “missing data” that is available on the official sites of the station in question. it would be nice to see the real values with the missing points added. Maybe i should post something about this find but i’m not an HTML head. i even have no idea how to put links or embed images. so even the unadjusted data has a bias and is tampered with it looks like…. Ouch…Brother Bob!! Having a comprehensive understanding of the motives of someone you don’t know – is that a gift you were born with, or can anyone learn it?? You certainly know how to tweek a presentation so as to encourage a gainful reply. Under your standard we would have no need for courts because we could never ever be allowed to determine the mind of the defendant. Bob did give Karl et al. the benefit of the doubt: Given that the authors must be aware of the implications of the fiddling, and in full realization that these implications should be discovered within hours of publication, they can only have come to the desired (and falsified) result through the use of incompatible/unwarranted/misleading/… methods. Perhaps you believe there is another way this dubious paper could have been produced honestly using real data and statistical best practices? Yes lets just throw “motive” out of the whole legal system, since it must be completely impossible to determine motive. Those darn prosecutors and their tricks. So if I started assigning motives to the bloggers here – Brother Bob, Sir Christopher, even the Master – do you reckon that would get past the Mods on guard duty around the Village?? People were talking about a slowdown in global warming in 2008. There was another hide the decline e-mail by Mick Kelly where he discussed how he was leaving the last few points off his presentations to keep the public from seeing a decline in temperatures. Have they not covered all sins, simply by inserting the word “possible” into title of the paper? The real deception here was the widely published presentation that a single paper suggesting “possible artifacts” has wiped out the need for an explanation of the global warming slowdown during a period of high GHC emissions. I recommend using the word “possible” more often in life. I’ve already spent most of this morning giving my wife a range of “possible” reasons why I was late home from work last night. The lipstick on my shirt and the smell of perfume can thus be explained away, by reference to the new “possible” explanations. She’s not buying any of them, but then she isn’t a gullible fool with a fixation upon maintaining her condition of motivated self-delusion. No doubt Karl et al will be seen as a loyal contribution to Obama’s Legacy and rewarded accordingly. Ask your friends how come we have never heard “The Pause” in the news when all this time we have been hearing about record temperatures over the past decade? If global warming is really such a problem, how come the scientists didn’t tell us about this 15 year “Pause or Hiatus”? Doesn’t the “Pause or Hiatus” make it look like information has been withheld; that scientists have not been telling us the whole story? Can you trust someone that only tells you 1/2 the story? Actually the announcement that 2014 was the warmist ever included a statement that the pause could continue another 5-10 years Per G S.
The Blob off the west coast of North America has brought fantastic summer weather to the Pacific North West. For those that don’t live here, we normally get about 180 days a year of measurable precipitation. In other words, it rains 1 out of 2 days of the year. June is often damp and cold. So if this is global warming, bring it on. Most of us would welcome San Diego weather year round. The salmon and farmers may not agree with you. This has been a terrible hay fever year. I want damp and cold back. In fact I want snow. Or the entire Pacific Northwest concreted over. I moved to Salem, Oregon, in late 2004, from San Diego, at age 45, and couldn’t disagree more. If you didn’t grow up in San Diego, you might think the climate ideal, but not only is near-daily sunshine as boring as near-daily overcast, but what natural precipitation there is leads to only a trickle of water to fill reservoirs. I don’t see how the west-of-Cascades PNW could thrive with a high desert climate. Ferd, depends on where you are exactly. On Whidbey Island it’s been a typical june, mostly sunny most of the time. We got a little wam a few days ago, but right now it’s right about average. Interesting title. does this mean that the paper is itself an artifact of data biases? a Freudian slip? As a theoretical linguist, I find this title interesting as well. The semantic structure of the title makes “the recent global surface warming hiatus” old information, and by definition an assumed fact. How can there logically exist bias in a fact? “recent global surface warming hiatus” – acknowledges that the hiatus actually happened. Thanks, Bob, for your clear words. I wish us all the best outcome in this controversy and agree that it looks like the choices made during the design of ERSST.v4 predetermine the results. When does the climate change paper from Lois Lerner come out? As far as I know, the normal procedure for anyone who has (what they consider to be) valid criticisms of a paper can submit these as a ‘comment’ to the publishing journal, in this case Science. Alternatively they can submit their own paper for peer review as a ‘rebuttal’. Do you intend to do either of these things? Yes, I do doubt it. It would be highly unethical for a reputable publisher such as Science to allow the authors of a paper that was the subject of criticism to review the critical paper or comment. If the alleged errors are so glaring, as has been alleged by several published authors here, including at least one climate scientist, then people may be at a loss to understand why a more formal rebuttal isn’t published via the normal channels. It’s not unusual at all to let the authors challenge the challenges to their paper. They know the paper best, after all. Who else should the Journal go to? And I didn’t say the challenges wouldn’t get published. Only that they wouldn’t get published until after Paris. Comments in science journals in general are not a favored form of communication on published work by both scientists and the journals. Which puts science about 20 years behind the times in terms of communication. There are a number of reasons for this, a large one being journals aggressively discourage comments using petulance and random bias to determine which comments are allowed. The link below by Prof. Rick Trebino of the Georgia Institute of Technology(which ranks number 4 in the country for Best Engineering Programs or in other words applied physics) described in detail the level of nonsense which can attend making a comment. It is an easy read and worth reading. We don’t yet know whether anyone has attempted to submit a comment to Science re this paper. In any case, there are other methods of publishing criticisms of papers, such as a formal rebuttal, which doesn’t have to be submitted to the journal that published the offending article. I just wanted to know whether Bob, or indeed Judith Curry, intended to do this, given the apparent confidence they have in strength of their criticisms of Karl et al. If not, then why not? That seems like a reasonable question. Perhaps they are doing both. Waiting for a rebuttal to be published could take months. Meanwhile the “inaccuracies” of this paper get more firmly entrenched. K15 said “Possible”. JC has, perhaps, connected the dots correctly? Why the weasel word(s) if the finding is robust? It’s a magical elevator. And there’s two versions of this. In the Wikipedia version, the reference source produces artifact A; which is the tuple of the claim Q and provenance P. Some media organization picks this up and reiterates claim Q, but with provenance R — from Wikipedia. This then is the artifact A’. A later edit to Wikipedia converts from provenance P to provenance S — from the Media Organization. This then is the artifact A”. Wikipedia has rather infamously gotten itself afoul of this for following this chain of events when the original provenance P was null or not provided. But even if P was initially correct and well validated, the later edits are still erroneous in nature. In the Science version, there are two initial artifacts; A and B, both directly instrumental in nature. At some point a team comes along and notes that A and B are in disagreement and creates the new artifact B’ on the basis of A. This creates a new claim as well as modifying the provenance. Which now moves from the instruments I to the instruments I1 as well as A and the adjustment process P.
At a later date a team, perhaps even the same one, notes a discrepancy between A and B’. And decide to rectify the discrepancy by adjusting A. This creates the new artifact A’ with a new claim, and a provenance based on I2, B’ and the adjustment process. By obviousness, A’ is now constructed by I1, I2, A, and both adjustment processes. At a later data still, another team notices that there is a discrepancy between A’ and B’. And decide to rectify the discrepancy by adjusting B’. And so on. This is a general problem when we don’t scribble out and keep immutable our provenance for any notion. And/or don’t pay attention to the provenance of what we rely on. And it hardly requires Bad Faith from any party as, in fact, this happens most easily when Good Faith is presumed of the other parties and that the previous work is ‘correct’ without regard to its provenance. What’s amusing to me about the Karl paper, is that it seems to have condensed this chain of events into the work produced in a single paper by a single set of authors. This is a general problem when we don’t scribble out and keep immutable our provenance for any notion. we see this in data cleansing all the time. the original “dirty” data isn’t preserved. rather it is over-written by new “clean” data. then this new “clean” data becomes the source for the next data cleansing operation. since you no longer have the original “dirty” data to compare, the repeated cleansing becomes like the party game of “pass the message”. each time there is a data cleansing operation, some corruption is inevitable. carried on long enough without reference to the original source, the more likely you are to end up with a message that is completely corrupt. When I worked in research a correction was made with a single line out so the original data never disappeared, The same in surveying. 0.089 and 0.143 C per decade. Anybody who represents they can actually measure these anomalies is totally full of it. Nothing but statistical hallucinations. If the Journal “Science” is committed to good science journalism, why would they not agree to include / publish a good rebuttal with good data to support it? It would seem that by doing so they could only increase their good reputation. Why not submit Bobs , or any other good rebuttal of the recent “Karl and company” paper to “Science”? Because it would puncture the myth regarding the correctness and necessity of Peer Review. There are two ways to be consistently correct. The first is to never make a mistake. The second is to never acknowledge a mistake was made. Could it possibly be the Lowess filtering you’ve elected to use for the bias adjustments, instead of the linear smoothing you used in the previous ERSST.v3b data? Comments like this and others seem to point out that filters are a way of getting to a desired result. To sharpen an image some photographers use unsharp-mask filter others use Photo Shops smart sharpen and still others use third party tools and this is just a small few of the filters that can be applied that all use complex math to get the “best” photo. The filters selected in all cases are the ones that gets the photographer the result most appealing to them. Anyways various statistical filtering is a science but the results from using this science is an art. In this case the art of coming up with an expedient political position. But filtering wasn’t enough so Carl had to also change the weighting factors until the desired results were achieved. Bravo Carl, for further debasing the already sullied field of climate. I wonder when somebody is going to stand up and give the speech from the movie Network, “”I’m as mad as hell and I’m not going to take it anymore!””. Unsharp doesn’t sharpen, it’s an illusion. It degrades the image but exaggerated contrast at boundaries. BTW it’s Karl not Carl . If you want to slate someone best to get the name right. That is quite improper and should be amended. Bob, if you want this to be taken seriously, you really should present your findings with error margins and preferably statistical significance levels. You might very well be fitting noise, which would make your results meaningless. IF you get a reply, please post it here so Dr. Karl can crucify himself with indescribable glory and public shame. Bob, do I understand correctly from the second part of this letter that you are suggesting that a low-pass filter caused a short-term artifact? I would be really interested to see how such a thing might be possible. Your question was how this was possible and is answered in my comment. Look at the beginning of thier figure 5 from Huang. The 32 and 16y filters are suspiciously flat obviously wrong. Also 32y at end. I’m not convinced that the lowess(0.1) has distorted the end by a lot but it does not look well centred on the data. But all the world’s scientific organizations agree. How far can they push the envelope with this nonsense? Are there any limits? I’m afraid this is a fundamentalist religion for the believers. Bob Tisdale – “Independent Researcher”. Did you give yourself this title? I wait for citations to your studies in the peer-reviewed scientific literature then. You are defining yourself by your words, your attitude towards “science”. If you mean by my “attitude” you mean preferring peer-reviewed scientific literature, then yep guilty as charged. I love the ways those who pretend to love science go out of their way to pervert it. Peer review means nothing more than a couple of your friends reviewed it and fixed the mis-spellings. Or it can be a futile waste of time for all concerned because no equations, raw data, nor methods were checked. Or it can mean a simple way to open a cesspool of near-endless deliberate delays and arguments about trivia as one editor/reviewer/judge/jury/advocate/priest fights tooth and nail and pen to prevent any such idea from any publication at all. Bob has provided more science and honest information in this site that you would have ever done in your lifetime, judging from your puerile insulting comments here, showing nothing but a sick and devious third rate mind of a no good loser. So put your name and show your qualifications and publications before you even attempt to comment on Bob’s work. And if you try and point out where Bob Tisdale is wrong (like I have in the past), you are likely to just get insults in reply. Me I do not spend much time on fake experts, there is plenty of good-quality science from dependable researchers to review. I’m guessing that you didn’t actually read the letter. In it he provided the evidence you are demanding. Amazing? RACook and appropriately named “venter” both claim that a simple, impassionate question “Did you give yourself this title?” is an insult. Anybody who does research and presents facts is a researcher and Bob Tisdale has done a lot of that. If you care to read through the archives or his earlier posts also you can see evidence of that. He presents his findings and data in full and answers all questions put up about his presentation. On the other hand, harrytwinotter and you Mike have provide nothing of the sort except throw in garbage. Both of you are of the same kind of third raters who provide nothing productive and just come to disrupt threads. I’m describing your behaviour exactly and it is a statement of fact, not an insult. You are exactly what I have stated as proven by your own posts. Go away somewhere else and stay with your ” good quality science ” harrytwiotter.”. The fact that you have been hanging in here thread after thread spewing nothing but bile shows what you are. Anyone who does research is a researcher and since he isn’t employed by anyone to do research, he is an independent researcher. That should be easy for a thinking person to understand. Of course when your only goal is to change the subject, then arguing over the meaning of words is a good way to do it. Trust me Harry, Bob’s stuff is peer reviewed. They are peering at it constantly. Look at how the various posters here have reviewed any and all articles presented. I would say that this site provides better “peer” review than any journal, even the major ones. Is that the best you can do? Surely not. It seem “consensus” is only of importance as and when it is convenient. We have heard about “natural ” ‘global warming . We have also heard from the alarmists about their so called “man induced global warming . We now have the latest and newest form global warming created magically by new NOAA “assumptions” . 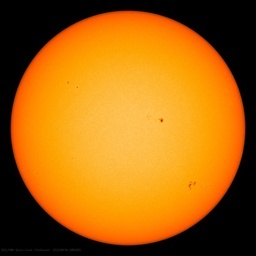 These assumptions are even more powerful than the sun as the new assumptions have doubled the rate of recent global warming which the sun has not been able to do nor have greenhouse gases been able to do this .. A new form of renewable energy ? . This is what Wikipedia has to say about Karl Popper: Sir Karl Raimund Popper was an Austrian-British philosopher and professor. He is generally regarded as one of the greatest philosophers of science of the 20th century. … I guess it will not take long before inductivists start rewriting it. As is not uncommon, the timeless movie Dr Strangelove coms to the rescue over “pervert”. Guano: I think you’re some kind of deviated prevert. And I think General Ripper found out about your preversion, and that you were organizing some kind of mutiny of preverts. Now, move! Mandrake replaces hands on head and begins walking. On top of that I don’t know anything about any planes attacking Russia. All I was told to do was get General Ripper on the phone to the President of the United States. Mandrake: Now just one second. You just said… the President. Guano: What about the President? Mandrake: Now, the president wants to speak to General Ripper, doesn’t he? Now, General Ripper is dead, is he not? I am General Ripper’s executive officer, so the president will bloody well want to speak to me, won’t he? There’s a telephone box over there, and the line may be open. Guano: You want to talk to the president of the United States? Mandrake: I don’t want to talk to him, Colonel, I’ve got to talk to him. And I can assure you, if you don’t put that gun away and stop this stupid nonsense, the court of inquiry on this’ll give you such a pranging, you’ll be lucky if you end up wearing the uniform of a bloody toilet attendant! Guano: Ok. Go ahead. Try and get the president of the United States on the phone. Mandrake enters phone booth and closes the door. Guano pushes it back open. If you try any preversions in there I’ll blow your head off. Mandrake: places coins in the slot and dials. Operator? This is Group Captain Lionel Mandrake, I’m speaking from Burpleson Air Force Base. Look, something very urgent has come up and I want you to place an emergency person to person call with President Merkin Muffley in the Pentagon, Washington D.C. Aaaa… Burpleson3-9180. No, I’m perfectly serious, operator, the President, yes the President of the United States. I’m sorry, I haven’t got enough change. Um, could you… could you make this a collect call, operator? Mandrake waits on the call to be placed while Guano looks on. Just one second, operator. to Guano They won’t accept the call. Have you got fifty-five cents? Guano: Well, you don’t think I’d go into combat with loose change in my pocket, do you? Mandrake: Operator, look, ah… is it possible to make this an ordinary… ordinary trunk call? Well, what do you call it… you know, ah… raps on phone box with knuckles oh, ah… station to station. counts change in his palm Oh, blast. Still twenty cents short. Operator, hold on one… ah… I shan’t keep you a second. to Guano Colonel, that Coca-Cola machine, I want you to shoot the lock off it. There may be some change in there. Mandrake: exasperated. Colonel, can you possibly imagine what is going to happen to you, your frame, outlook, way of life and everything, when they learn that you have obstructed a telephone call to the President of the United States? Can you imagine? Shoot it off! Shoot! With the gun! That’s what the bullets are for, you twit! Guano: Ok. I’m gonna get your money for you. But if you don’t get the President of the Unites States on that phone, you know what’s going to happen to you? Guano: You’re going to have to answer to the Coca-Cola Company. All clear now? Priorities right? I wonder if NOAA has ever replied to Tisdale — this time or any other time..